In the spring the Glacier Lily can be found blooming in open areas immediately adjacent to snowfields in Glacier National Park. They are one of the first wildflowers to come up and bloom immediately after the edge of the snowfield has retreated. The bulbs of this lily is a favorite food of the Grizzly bears, and it is very common to come across large areas where the soil has been turned over by the bears in their foraging for the bulb. 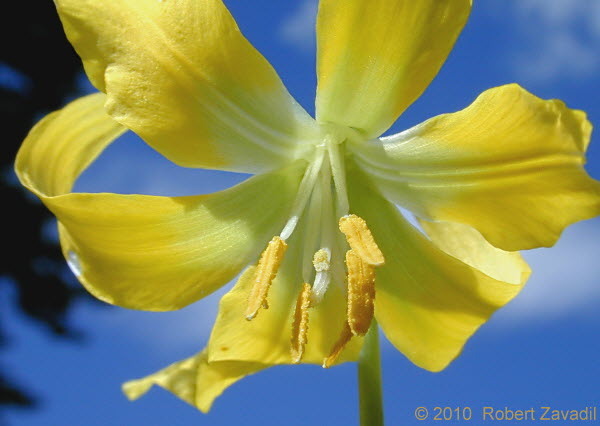 This particular view of the Glacier Lily is usually seen only by the field mice.